We love a good squash, butternut, spaghetti, acorn, etc. 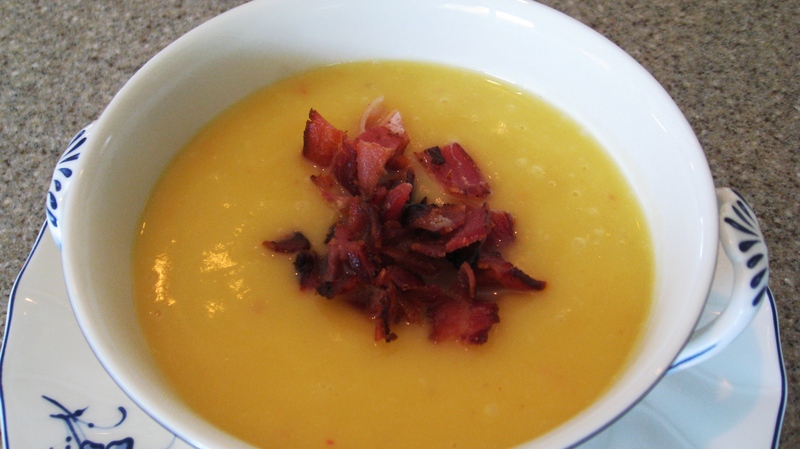 Today we would like to share our Acorn Squash Cream Soup topped with yummy crunchy bacon. Mark Sisson calls Acorn squash a smart fuel, and duly so. This soup is fabulous warm or served chilled on a hot day for lunch. Either way, it is incredibly light and yet totally satisfying. We recommend at least 2 strips of bacon as topping. 🙂 This recipe feeds 4 very hungry Primals, or 6 as an appetizer. Cut acorn squash in halves long side and removed all seeds with a big spoon. Place the squash upside down onto cookie sheet and bake for 15 minutes. Then add ¼ tbsp to one half and salt lightly. 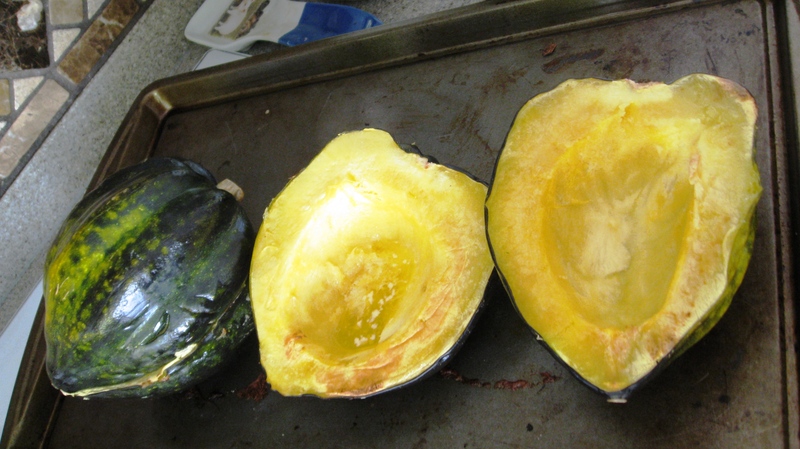 Put squash back together so it looks whole and bake for another 15 – 20 minutes. You will know if it’s finished by taking a look at the squash, if it’s very shiny and moist looking on the outside and if a fork can penetrate the skin, then you’re good to go. Take it out of the oven and let it cool for about 10 minutes. Otherwise it’s too hot to peel and you’ll burn yourself. Once cooled, scoop out all the flesh and place it in a soup pot. Tip: I usually put on some dishwashing gloves and scoop everything out with my hands – it is so much easier and faster. Mash the squash up with your hands or a big spoon and add all other ingredients with the exception of the bacon. Once all ingredients are coarsely mashed, puree them with a handheld blender until very smooth. Sounds delicious. I made this Moroccan-style stuffed acorn squash over the weekend. Just bought a few squash, acorns and butternuts, so this would be good to try later this week. We love squash and bacon, so this looks really tasty. I just made curry squash and coconut with chicken soup. We put a link on our page. It’s from Lifescript. Hi Margie, could you please post the link here in our forum? I couldn’t find it easily on your page; we’d love to check it out, thanks! I’d like to start a blog so I can easily share my personal experience and feelings online. Please let me know if you have any kind of recommendations or tips for brand new aspiring bloggers. Thankyou! It takes passion commitment, but if you write in your journal every day, you may enjoy blogging. Provide your readers with something interesting and you will be good to go. Good luck and happy blogging!